Tulu Nadu or Tulunad, is a region in India where the Tulu language is predominantly spoken. The Indic people known as Tuluva are natives of the region. The erstwhile district of South Canara is the core of the Tulu speaking region. The Old South Canara district is currently divided into Dakshina Kannada and Udupi of Karnataka and Kasaragod district of Kerala. This region is not an official administrative entity but there has been a movement in the region demanding statehood for Tulu Nadu within the framework of the Republic of India. Mangalore, Udupi and Kasaragod are its important cities. The erstwhile district of South Canara is the core of the Tulu speaking region called Tulu Nadu. Tulu and various dialects like Kundagannada, Beary. KA19, KA20, KA21, KA62, KA70, KL14. Royal emblem of the Alupas, the ruling dynasty of the region from 2nd century to 15 th century C.E. A regional map of Tulu Nadu in Karnataka. Tulu Nadu also includes Kasaragod district of Kerala state. Ptolemy, the 2nd century geographer identifies the Tulu Nadu region as Olokhoira which is widely believed to be a corruption of the term Alva Kheda, 'the land of the Alvas'. Historically, Tulu Nadu included the two separate lands of Haiva and Tuluva. The longest ruling and oldest known native dynasty of Tulu Nadu was that of the Alupas (c. 5th - 14th century C. E.). Their kingdom was also known as Alvakheda. They initially ruled independently and later were the feudatories of the prominent dynasties. The Kadamba dynasty of Banavasi was the earliest, under which the Alupas flourished. Later the Rashtrakutas of Manyakheta, Chalukyas of Badami, Chalukyas of Kalyani, Hoysalas of Dwarasamudra (Halebidu) and Rayas of Vijayanagara were the overlords. The Alupas, however, were independent and their subordination was nominal at best. They ruled until the Vijayanagara Empire took control of Tulu Nadu from 14th to the 17th centuries. During the rule of Vijayanagara, Tulu nadu was administered in two parts – Mangaluru Rajya and Barkuru Rajya. Tulu Nadu was the original homeland of the dynasty that founded the Vijayanagar Empire based in eastern Karnataka. 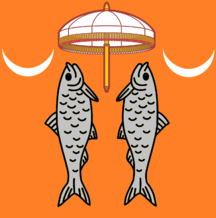 Tulu Nadu was governed by the native feudatories of the Vijayanagara Empire until the 18th century. These feudatories gained power towards the end of Alupa period. Notable among them were the Chowtas of Ullal and Moodabidri (c. 1160-1801 C.E), Ajilas of Venur (c. 1418-1800 C.E), the Savanta or Samantha Rajas of Mulki (c. 1411- 1700), the Bhairarasa Odeyas of Karkala (c. 1240-1650 C.E), the Tolaharas of Suralu (c.1139-1800 C.E), the Bangas of Bangadi (c. 1410-1800 C.E. ), the Rajas of Kumbla (c. 12th century - 1800 C.E) and the Rajas of Vitla (c. 1436-1800 C.E). The region became extremely prosperous during Vijayanagara period with Barkur and Mangalore gaining importance. After the decline of the Vijayanagara Empire, the Keladi Nayakas of Ikkeri controlled much of Tulu Nadu.Over the following many centuries, more ethnic groups migrated to the area. Konkanis from Goa arrived by sea, as Mangalore was a major port that served not only the Portuguese but also the Arabs for maritime trades. Jains were already a prominent group and even today are uniquely preserved in Tulu Nadu. Though small in number, the Jains left behind indelible reminders of their glory with temples (bastis) in (Moodabidri) and monolithic statues of Bahubali in Karkala, Venoor and Dharmasthala. In the 16th century there was a large influx of Catholics to Tulu Nadu from Goa. The Muslim community of Tulu Nadu were basically Arab traders who married local women and settled there. Some came from Kerala. They speak the Beary dialect, which is a mix of Tulu and Kannada, and the others speak Urdu. Under Portugal, the region was called the Missao do Sul (Mission of the South). In the 18th century, it was conquered by Hyder Ali, the ruler of Mysore. After the British defeated Haidar's successor Tipu Sultan in 1799, the region was attached to the Madras Presidency before being reverted to the state of Mysore after independence. Mysore has since been renamed Karnataka. At the end of the 18th century, Hyder Ali and Tipu Sultan controlled the region. Mangalore played a prominent role in Tipu’s battles with the British. The British gained full control in 1801, after Tipu's death in 1799. The British ruled the region with Madras (now Chennai) as its headquarters. Tipu conquered the region and the British conquered it from him. Under the British, the region was organised into the districts of North Canara and South Canara respectively. As per Hindu mythology Lord Parshurama commanded Lord Varuna to make the seas recede to make the Tulu Nadu. When the states were reorganised on linguistic basis in the 1956, Tulu Nadu (South Canara) which was earlier a part of Madras Presidency and North Canara which was a part of Bombay Presidency became part of the newly formed Mysore state, which was later renamed as Karnataka. Kasargod became part of the newly formed state of Kerala. The Tuluvas began demanding official language status for Tulu and a separate state named Tulu Nadu for themselves. Organisations like the Tulu Rajya Horata Samiti have taken up the cause of the Tuluvas and meetings and demonstrations were held at towns like Mangalore and Udupi to voice their demand. According to the 2001 Census of India, the population of the region was 3,005,898. The majority of the population in Tulu Nadu are Tuluvas, Other native ethnic groups include Kannadigas, Konkanis and Bearys. Tigalari script has been used for Tulu since at least the 10th century. The most widely spoken Language is Tulu which belongs to the Dravidian family of languages, and whose native speakers are referred to as Tuluva. The number of Tulu speakers was estimated to be about 1.7 million in 2001, although some sources quote as many as 3 million. The other languages spoken in Tulu Nadu include Kannada, Malayalam, Konkani, Koraga and Beary. The Tigalari script, bears partial similarity to the Grantha script. It was used by Tuluvas for centuries, before it was eventually replaced by the Kannada script. Most Sanskrit works and Tulu classics are present in this script, with a few in other scripts. This script was used by Brahmins. Tulu Nadu lies along the Konkan Coast. Tulu Nadu is bounded on the west by the Arabian Sea and on the east by the Western Ghats. Tulu Nadu spans an area of 8,441 km2 (3,259 sq mi), roughly 4.4 per cent of the total geographical area of present-day Karnataka. Tulu Nadu also experience heavy rainfalls during Monsoon season. The coastal area of Tulu Nadu is very rich with respect to rainforests and backwaters. The region has a tropical climate; summer and winter months experience similar temperate conditions, with average temperatures ranging from 24 °C to 33 °C. Shri Madhva Acharya, a Hindu philosopher and the chief proponent of the philosophy of Dwaita or Dualism. 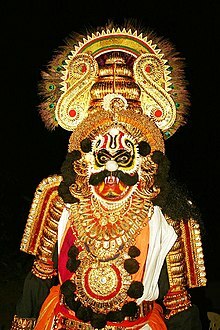 The Yakshagana is a night-long dance and drama performance practised in Tulu Nadu with great fanfare. Pilivesha is a unique form of folk dance in the region fascinating the young and the old alike, which is performed during Marnemi (as Dussehra is called in Tulu) and Krishna Janmashtami. Karadi Vesha (Bear Dance) is one more popular dance performed during Dasara in Tulu Nadu. Daiva Kola (Spirit worship), which is usually done at night is practised here. Kambala (Buffalo race) is conducted in water filled paddy fields. Korikatta (Cockfight) is another favourite sport for the people. Nagaradhane (Snake worship) is practised in the Tulu Nadu according to the popular belief of the Naga Devatha to go underground and guard the species on the top. Udupi cuisine is popular across South India, mostly due to Udupi restaurants, which are primarily vegetarian. Apart from Southern India, there are famous Udupi Hotels in Mumbai and New Delhi too. Historically, Tulu Nadu was primarily dependent on agriculture and fishing. The main crops grown were rice, Bengal gram, horse gram, vegetables and fruits. Plantation crops like coconut, areca nut, cocoa, cashew nut, and pepper are also grown. In the early 20th century, the Mangalore tile industry, cashew nut processing, and the banking industry grew substantially. Tulu Nadu is called "the cradle of Indian banking". Five major banks of India (Syndicate Bank, Canara Bank, Corporation Bank, Vijaya Bank and Karnataka Bank) have their origins here. In the early part of the 21st century the area has been transforming itself into a hub of the information technology and medical services industries. There has been large-scale decline in agriculture and related industries due to the non-availability of labour and preference for white-collar jobs. Agricultural land is being converted to commercial and real estate properties, and environmental pollution is increasing drastically due to large-scale deforestation and increase in automobile use. A public sector petroleum refinery (MRPL) was established in the 1990s. Some chemical plants (e.g., fertilizers and pesticides) have been established. This region contributes the second highest revenue to Karnataka state after the city of Bangalore. This region has an international airport at Mangalore which is well connected to the rest of India and middle eastern countries. New Mangalore port (NMPT) is one of the major port of India is located at Panambur, Mangalore. ^ "Tourism in DK District". National Informatics Centre, Karnataka State Unit. Retrieved 26 March 2008. ^ "Tour to Udupi". Tourism of India. Retrieved 26 March 2008. ^ a b c "Census GIS India". Census of India. Archived from the original on 11 January 2010. Retrieved 26 March 2008. ^ "Tulu Nadu, Kasaragod, Kerala, India | Kerala Tourism". www.keralatourism.org. Retrieved 12 December 2016. ^ a b Bhat, N. Shyam (1998). South Kanara, 1799-1860: A Study in Colonial Administration and Regional Response. Mittal Publications. pp. 17–45. ISBN 9788170995869. Retrieved 18 April 2015. ^ "Tulu Nadu: The Land and its People by Dr. Neria H. Hebbar". Boloji. Retrieved 12 December 2016. ^ "Brahmins of Tulu Nadu - MADHWA SAMAJAM KOLLAM". sites.google.com. Retrieved 12 December 2016. ^ "News headlines". DHNS. 21 October 2006. Retrieved 4 September 2016. ^ "Tulu organisations to meet soon". The Hindu. 6 March 2008. Retrieved 4 September 2016. ^ "ScriptSource - Tulu (Tigalari)". scriptsource.org. Retrieved 12 December 2016. ^ "Census of India - Statement 1". Registrar General & Census Commissioner, India. Retrieved 26 May 2013. ^ Lewis, M. Paul, ed. (2009), "Tulu", Ethnologue: Languages of the World (16th ed. ), SIL International, retrieved 12 November 2009. ^ a b D.N.S. Bhat (1998). Sanford B. Steever (ed.). The Dravidian Languages. Routledge. p. 158. ISBN 0-415-10023-2. ^ Dr. K Padmanabha Kekunnaya. "Tulu Language and Script - Shivalli Brahmins". Shivalli Brahmins. Retrieved 4 September 2016. ^ Lozupone, Patsy; Beehler, Bruce M.; Ripley, Sidney Dillon (2004). Ornithological gazetteer of the Indian subcontinent. Center for Applied Biodiversity Science, Conservation International. p. 82. ISBN 1881173852. ^ "Madhvacharya | Udupi Philosopher | Personalities". Karnataka.com. 7 October 2011. Retrieved 12 December 2016. ^ "Yakshagana". SZCC, Tamil Nadu. Archived from the original on 17 August 2007. Retrieved 7 December 2007. ^ Plunkett, Richard (2001). South India. Lonely Planet. p. 53. ISBN 9781864501612. ^ Stanley G. Pinto (26 October 2001). "Human 'tigers' face threat to health". The Times of India. Retrieved 26 May 2013. ^ Stephen D'Souza. "What's in a Name?". Daijiworld Media Pvt Ltd Mangalore. Retrieved 26 May 2013. ^ "Nagarapanchami Naadige Doddadu". Mangalorean.com. 18 August 2007. Retrieved 26 May 2013. ^ "Canara Bank :: About Us :: Profile". www.canarabank.com. Retrieved 23 October 2016. ^ "Welcome to Karnataka Bank Ltd". www.karnatakabank.com. Archived from the original on 17 March 2012. Retrieved 23 October 2016. ^ "Vijaya Bank". www.vijayabank.com. Retrieved 23 October 2016. ^ "Syndicate Bank- ourprofile". www.syndicatebank.in. Retrieved 23 October 2016. ^ "History | Corporation Bank". www.corpbank.com. Retrieved 23 October 2016. ^ Gavin Shatkin (14 August 2013). "Chapter 10 : Planning Mangalore: Garbage Collection in a Small Indian City". Contesting the Indian City: Global Visions and the Politics of the Local. John Wiley & Sons. ISBN 978-1-118-29584-7. ^ "NITK Surathkal - Info, Ranking, Cutoff & Placements 2016 | College Pravesh". College Pravesh. 26 September 2016. Retrieved 12 December 2016. ^ "Top ten Medical Colleges of India". Tack-in.com. 31 July 2007. Retrieved 26 May 2013. ^ "Top Medical Colleges in India". Knowurcollege.com. Retrieved 26 May 2013. Bhat, P. Gururaja (1975). "Studies in Tuluva history and culture: (from the pre-historic times upto the modern)". Wikimedia Commons has media related to Tulu Nadu.